Anyone who knows me well will say that I am all about the details. If there's one thing I love most about getting dressed, it's definitely the accessories. I tend to wear a lot of neutral colors and simple lines so a great cocktail ring or a fun pair of shoes allows for a more playful touch. Now that I work at a school where "sneakers are encouraged", I find myself wanting to dress up a little more even when the plans for the day just include getting groceries and gas. 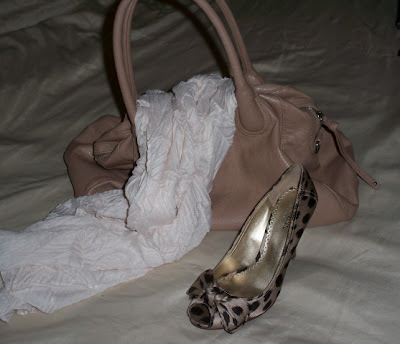 This season, I have completely fallen in love with leopard and creamy blush colors. Although I still wear a lot of black, grey, and navy, I've also been mixing in some softer hues. Typically associated with Springtime, I think nudes, cremes, camels, soft pinks and dove greys make for a more sophisticated palette than in years passed. Throw in some surprisingly go-with-everything leopard and you've got a perfect look that's both sultry and sweet. Looking at this picture, I realize I need to get my hair done again. It's been so dry where I live that my hair has been a static-y, flat mess! I love this outfit Noelle! I have been looking for a great pair of leopard print shoes, and I absolutely love yours! Oh I LOVE your shoes, those are the cutest. Your entire outfit is fab! And of course, loving the shoes! LOVE this outfit!! Leopard print is one of my all-time favorite things :) And blush pink is a new-found love for me. Everything about this outfit is lovely and is exactly something I would wear! You look awesome Noelle! Great bag! I love everything about this outfit. Especially the shoes! Cute!! Lovely outfit and that shoes are so cute. I disagree about your hair they look amazing and I totally agree on the importance of details. love the outfit!! this is totally how how dress at times too!! but sometimes i just keep the accessories simple too - i have heels almost just like this from Aldo from last year - they kill my feet, so haven't worn them - maybe should with tights so i can stretch 'em out!! I HEART those Express shoes! DeAnna: I hate painful heels! I have a few pairs that I love to look at but can't bear to wear. Boo! oh accessories def. the BEST PART! Those shoes are really fab. I gotta get the something like it. It's the cutest thing! Love this look Noelle! Those leopard pumps are sweet and sassy! Love the details! Thank you girls! As long as you get a little leopard in your life, you're good to go! And it's everywhere this season! Martina: Wow, I would love to visit your country!